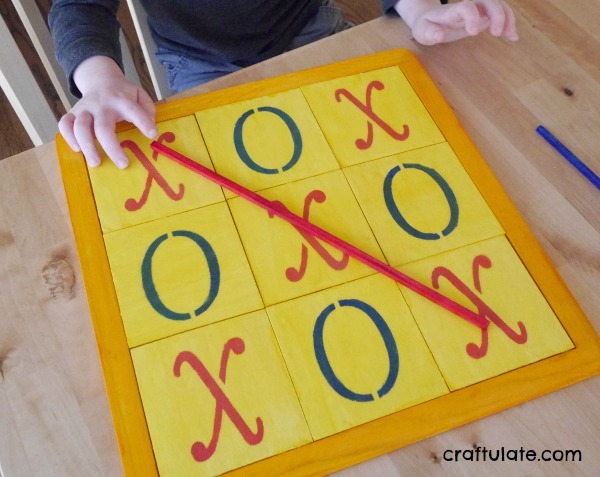 I really enjoyed making this wooden tic tac toe game for my son! Since becoming an Ambassador for PLAID, I have been on the lookout for suitable surfaces for kid-friendly crafts. As soon as I saw the Wood tile board with nine tiles – I just KNEW that I had to make it into a game of tic-tac-toe! The board comes with a hanging hook on the back (which I removed), so I guess its intended use is a patchwork-style piece of wall art. It’s made from unfinished wood, so ideal for painting in some bright colors that would be appealing to kids. To paint the tile board I used FolkArt Ultra Dye – I’ve used it before and it is perfect for painting unfinished wood. For the base I used Ultra Dye Solar Power. It only needed one coat and the color was great! For the nine playing pieces I decided to paint them in Ultra Dye Pucker Up. When they were dry I used Apple Barrel Cobalt Hue Gloss and Apple Barrel Hot Rod Red Gloss to make the X and O on each side of the tiles. I used letter stencils to get the shapes and a spouncer to apply the paint. For the winner, I also painted two long wooden square dowels in corresponding blue and red colors using Ultra Dye Blue Bayou and Ultra Dye Infra Red – so that the dowel could be placed when the row of three had been attained. The game play is slightly different – you decide which player is going to be X, and which O, remove all the squares from the board, and place them in a pile. Each player takes a square from the pile, and places it with their chosen symbol facing up. As there are nine pieces it isn’t possible to divide the tiles evenly, so this solution works well! After painting all the pieces with one coat of Mod Podge Gloss – the game was finally ready! My son had been trying to work out what I was making – and as soon as he saw the Xs and Os he worked it out!